Whether you are making a new home your own or giving your old home a new look, the right post caps can give your fence or deck distinctive character. Welcome to Atlanta Post Caps! We are proud to be a family-owned and operated small business. Our company has been doing business out of our Decatur, Georgia offices and manufacturing facility for ten years. We are direct sellers, so you can purchase fence post caps from us, even if you’re a retail customer. You will never have to look for an authorized dealer to buy our products or pay a markup because you’re not dealing with the middlemen. We are proud to offer customers all over the world, a line of ASA resin fence post caps that we make in our Georgia facility. Our ASA resin fence post toppers are the only patented post caps on the market, and they are made in the U.S.A. In addition to our best-selling ASA resin deck post caps, we sell metal (aluminum), post and pile, and solar post caps.Our ASA resin fence post caps are made from weather-resistant hard plastic. It is the same material that automobile and marine vehicle makers use in their products. 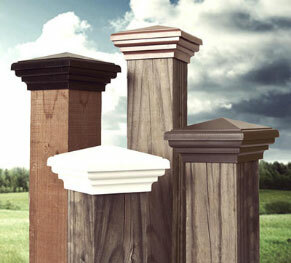 We have three design styles for our ASA resin fence post toppers. Post Caps in the slim profile series are our most economical of our ASA resin post toppers. Post Caps in the Estate Series are pyramid-shaped, while the post caps in the Plateau Series have a flat top. ASA resin post caps are easy to install, thanks to our patented SNAP-CAP installation method. Our slim profile post caps are made from cast aluminum. They come in nominal and actual sizes in 4x4 post caps, 6x6 post caps, and 8x8 post caps. Their colors include plain aluminum, powder coated black, copper, and white. They are easy to install, as are all of our post caps, and they come with a one year warranty. Our solar post caps come in a variety of sizes and styles. Whether you’re looking for a modern accent, or something more traditional, our solar post caps will fit those needs. Colors are achieved through powder coating aluminum and electroplating. All of our solar post caps work through a solar cell charging the included battery. The lights come on automatically at dusk and turn off automatically, too. **Most Post Caps ship for free, some require purchases over $50.00 for free shipping or have flat rates. ** The Slim Profile, Estate and Plateau Series all come with a 10 Year Guarantee against warping and fading.